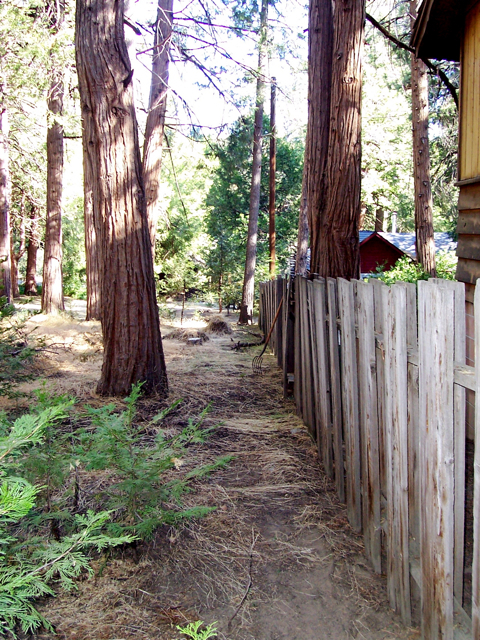 At 4:55 p.m. on Wednesday, July 7, an earthquake shook Idyllwild, CA. It registered a 5.4 on the Richter scale, and the epicenter was in Borrego Springs, about 85 miles away, according to news reports. At the time, I happen to be sitting on the ground outside in my neighbor’s yard. I was taking a break from raking. The earthquake felt like a big, base drum knocking underneath me. Then the vibrations got louder and more intense. Yet, afterwards, she threw up. My neighbor, Gene, who lives in Whittier, ran over pretty excited. Come to think of it, I did hear dishes rattling in the house next to me. It sounded so faint and delicate, like porcelain wind chimes. Just then, a jogger passed by, and Gene asked if he felt the earthquake. “Yep, I thought I felt something,” he said, and kept on. 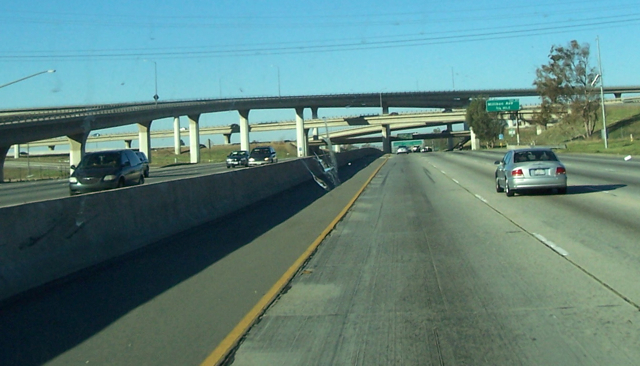 People driving in cars rarely feel earthquakes. My neighbor, Louise, is one of them. Guess it’s the weight of the car and the forward motion that absorbs the earth shaking for 10 seconds. But Gene said that when the Northridge Earthquake hit, he was driving on a freeway, and his car slid sideways. My friend, Charles, 80, was inside his house in Fern Valley at the time. He admitted to being scared. For details on the earthquake in Idyllwild and anywhere around the world, visit the Green Café web site at www.greencafe.com. Jeffrey Taylor, a computer programmer, has tapped into free USGS information on sismetic data. Results are available almost immediately. 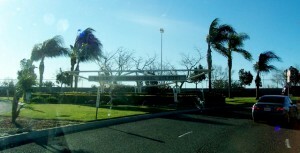 After a series of large earthquakes had occurred around the world, namely Haiti and Chile, California experienced a 7.2 on Easter Sunday, April 4, without much incident. The epicenter was in Colexico, California about 114 miles from Idyllwild. 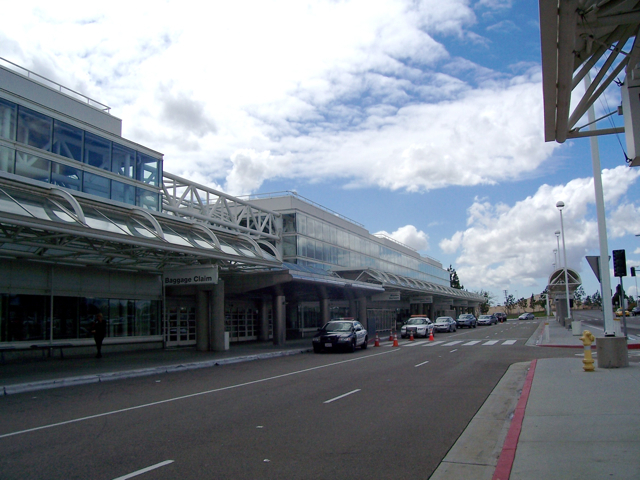 Twenty six Idyllwild Arts students were scheduled to arrive at Ontario Airport that day, with more expected at LAX and Palm Springs Airports. 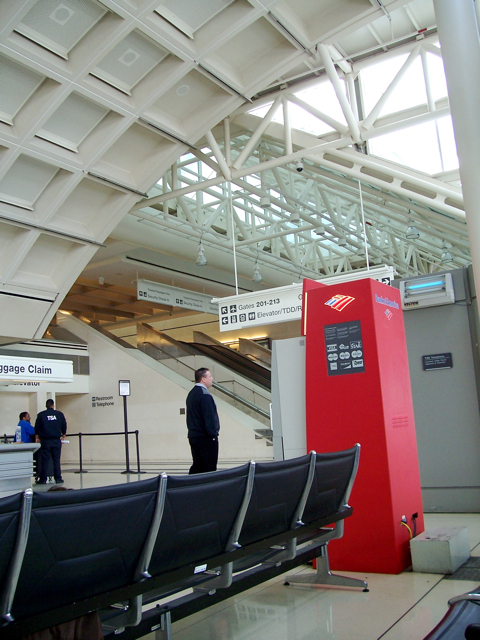 When the earthquake hit at 2:40 p.m. at Ontario, people waiting on passengers noticed something unusual. 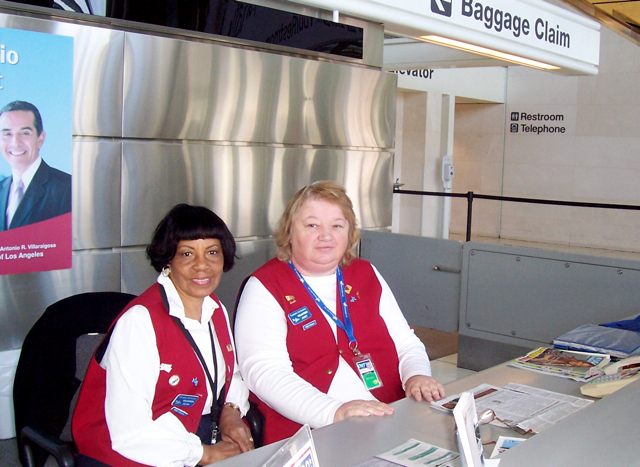 “Did you feel that?” those standing near the information booth said to strangers nearby. Everyone smiled and appeared to be relieved when the tremor stopped. The actual tremor lasted for several seconds, but was longer than most earthquakes that are felt in the Idyllwild area. She said that there was no damage to her business, and nothing fell from the shelves, but it was more intense than most earthquakes lately. “If you were close to the epicenter, you wouldn’t be able to stand up,” said Jeffrey Taylor, who owns Green Cafe, an internet business in Idyllwild. On his web site, www.greencafe.com, Taylor has programmed information from U.S. government web sites that will automatically register any earthquakes and tsunamis from around the world. Immediately, the earthquake registered on his web site, along with 10 aftershocks in the days following. 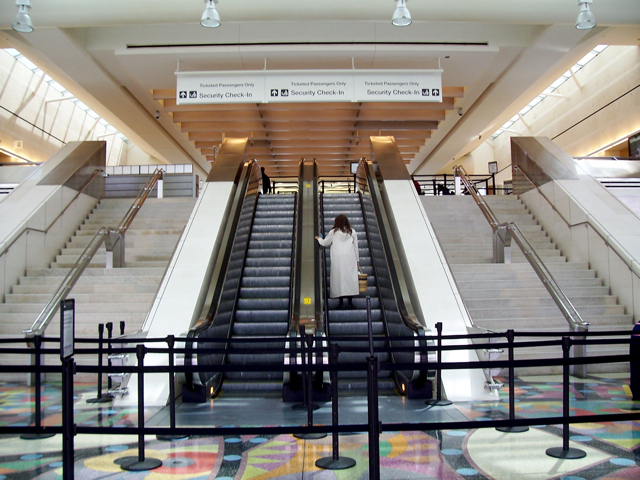 “It’s as large as the Northridge earthquake,” Taylor said somberly. He was living in Los Angeles at the time, and had run outside to safety, only to be bit on the forearm by a strange dog. The large scar still is evident. Afterwards, he came to Idyllwild to relax, and realized that he could start an internet business here. 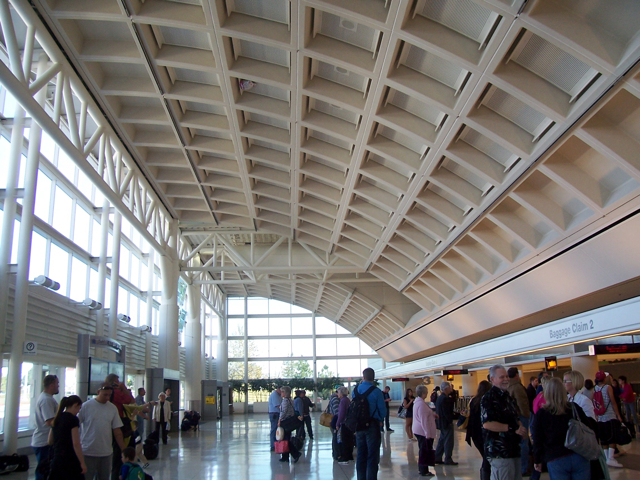 When the earthquake hit Sunday, Idyllwild Arts student Jacob Gershel’s plane was circling over Ontario Airport. Other Idyllwild Arts students who arrived later from Alaska around 5 p.m. missed the excitement. Others, like Rosario Flores from the Idyllwild Arts Finance Department, didn’t have a happy Easter. “The earthquake was close to the Mexico border,” she said, of her family that still lives there. By Wednesday, April 7, they still didn’t have electricity or water. For more information on the Colexico earthquake and its aftershocks, visit www.greencafe.com. At approximately 3:36 a.m. on Wednesday, Feb. 10, a mild earthquake shook Idyllwild. 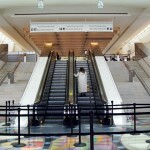 It only lasted a couple of seconds, but came on the heels of several natural onslaughts in recent days. 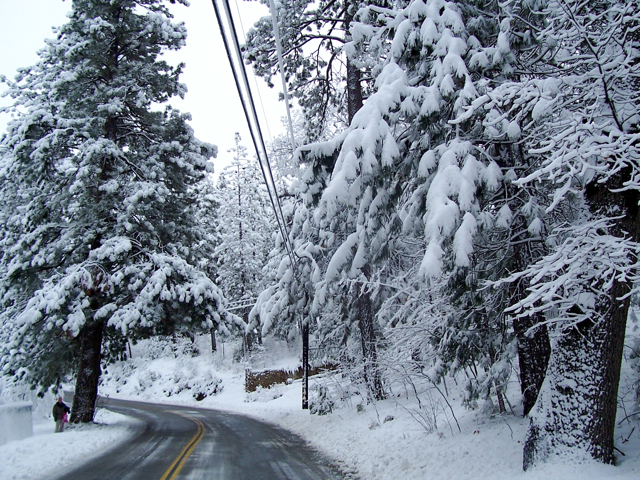 On Tuesday evening, Feb. 9, Idyllwild received about six inches of more snowfall. This was added to an already snow-packed base on the ground from a couple of weeks ago. Around 9 p.m. after it stopped snowing, Highway 243 was relatively clear, but the side streets were still hard to maneuver and vehicles were moving cautiously. 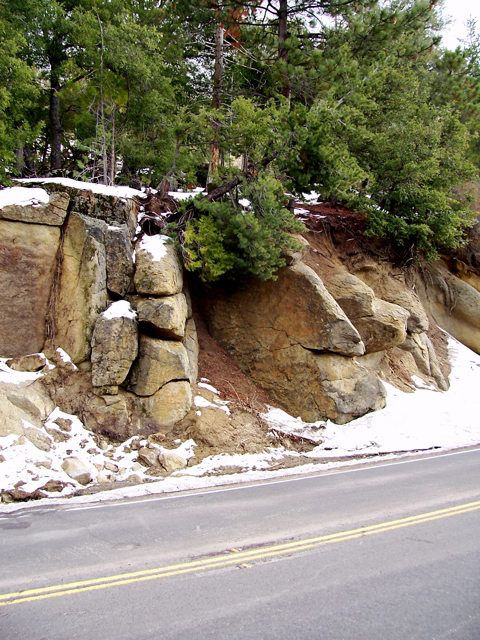 Moreover, on Saturday afternoon, Feb. 6. a mud and rock slide caused major road damage to a section of Hwy. 74 at the Cottonwood burn area (at the base of the hill). 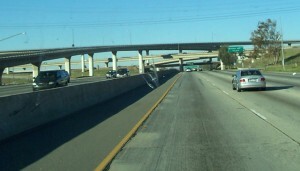 The California Highway Patrol closed Hwy. 74 from Mountain Center to Hemet until further notice. 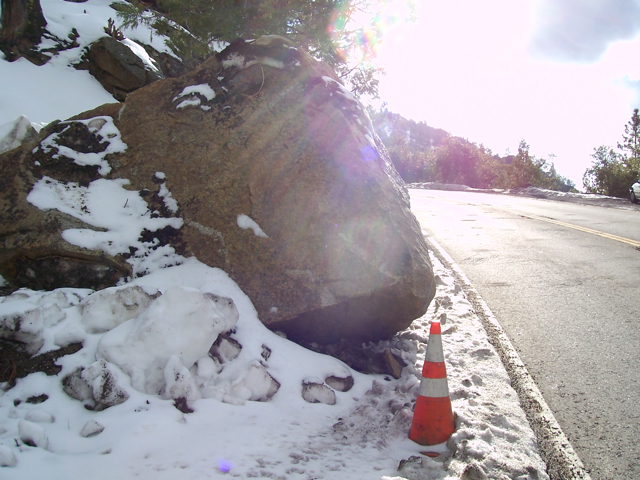 Steve Hudson, an Idyllwild resident, said that it may take up to one month for the road to be fixed. In the meantime, residents are going through Garner Valley and Banning to get down the hill. On Jan. 29, on Hwy. 243, near the U.S. Forest Service Alandale Station, a boulder slid onto the road around 10:30 p.m. (see post on this site for photos and more details). It was safely removed within a few hours. 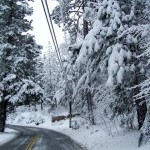 For the latest weather information in Idyllwild, visit the Town Crier web site, www.towncrier.com, and for up-to-the-minute earthquake information, visit the Green Cafe web site, www.greencafe.com. This local site uses earthquake information programmed from government web sites. As a service, it provides information about earthquakes that occur near Idyllwild and from around the world. 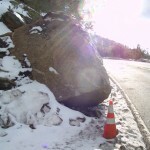 Boulder removed from Hwy. 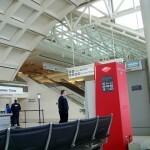 243 is marked by pylon. 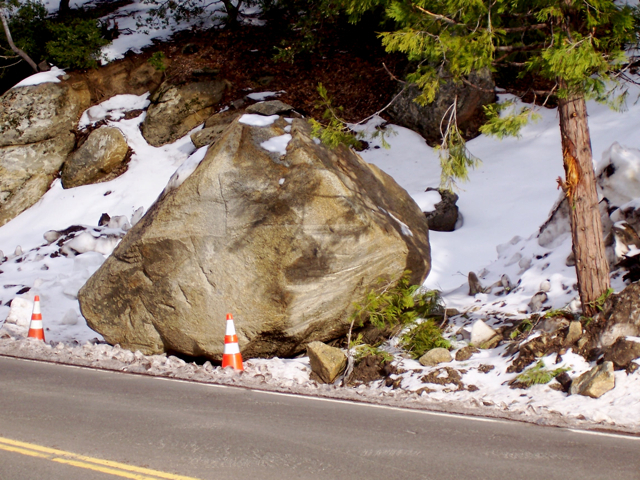 Around 10:30 p.m. on Friday, Jan. 29, about a mile north of the U.S. Forest Service Alandale Station, a large boulder managed to slide down the hill and land on Highway 243. A California Highway Patrol (CHP) officer was parked there in his sedan with his flashers on, covering the spot for oncoming drivers. A Caltrans bulldozer was also there ready for the move, and another was on the way. They had to get that boulder, about the size of an SUV, out of the road. It looked like a formidable task, maybe something that would take a couple of hours, so I quickly called Jenny Kirchner, the photographer for the Town Crier newspaper. “You might want to come take a photo of this boulder. It’s right in the middle of the road near the Alandale Station,” I told her voice mail, and left it at that. As it turned out, she got the message and wanted the photo, but was in a movie theater in Palm Springs at the time—without her camera. After the movie, she drove up the hill to get her camera, then down again to get the shot. She took it about 2 a.m., after it had been moved. How she found the bolder in the dark and without a CHP marking the spot I’ll never know. The photo made the Feb. 4th issue of the paper, on page 3. I had to go down the hill the next day and couldn’t find the boulder anywhere. As it turned out, Caltrans had moved it about 20 yards from where it slid. There’s a fallen tree and a big hole left there (see photo), but two neon pylons marking the new spot. 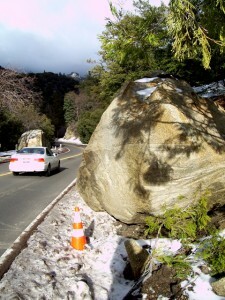 Boulders blocking Highway 243 are a big deal around Idyllwild, and especially a sore spot for the Town Crier newspaper. 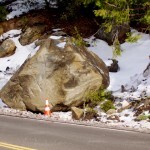 About two years ago, a much larger boulder had blocked the road for about a week, causing residents and tourists to go around the Hemet way. After much consideration, Caltrans blew up the bolder to get it out of the road. Becky Clark, the former Town Crier editor, couldn’t even make it to work in Idyllwild that week, and was struggling to put out the paper from home. A reporter from the Press Enterprise in Riverside had called her asking about the boulder, and when it was going to be removed. This boulder that slid last Friday night wasn’t quite as much of a headache for Idyllwild residents. In fact, only a few people knew about it. Yet, whenever it rains a great deal like it has over the last couple of weeks, rockslides are likely, and drivers should be wary. NEXT UP: Photos of the bridge out in Valle Vista, at the bottom of the hill. Some say that it’ll take one month to fix. A fallen tree and hole mark the spot where the boulder had been. Boulder size comparison to car.